Being Frugal and Making It Work: Time-Saving Daily Kitchen Tips from a Busy Mom! Homemade stew, casseroles, spaghetti and lasagna are among my families favorite meals for dinner. Sometimes making these one-pot dishes is a real time-saver, but the clean-up is almost always a nightmare. You know what I'm talking about, right? Baked-on foods and sticky messes can bring me nearly to tears after an already long and busy day. As a busy mom, I'm always looking for the easiest, most efficient, time-saving ways I can run my kitchen, prepare meals and get the cleaning done as quickly as possible. Leaving more time to spend with my children and family. With Dawn’s line of power products, you can get the amazing power of an overnight soak in just five minutes. These dishwashing products cut grease and dissolve tough foods on your everyday dishes (even the ones you bake in) without the effort of elbow grease! Dawn Power Clean has micro-scrubbing enzymes that power through tough food messes with ease! Enjoy cooking all your favorite dishes without worrying about the trouble and hassle of the clean up. Your most dreaded chore of washing greasy, baked-on dishes is now a breeze with Dawn Power Clean. 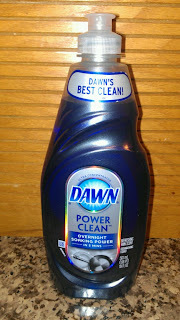 I recently had the opportunity to test out the cleaning power of Dawn Power Clean, and I can say that I'm hooked! At first I was skeptical - could it really work in just 5 minutes? The answer... YES! I couldn't believe how well it worked. So put your dirtiest dishes to the 5-minute soak test with Dawn Power Clean! You'll be glad you did. **Line it with aluminum foil: When I'm making lasagna, baked casseroles, or baked chicken... I always line the dish with foil. After dinner, I simply pull out the foil, roll it up, and throw the sticky mess into the trash! Quick and easy clean-up! **Stock up: Our pantry is always stocked with basic essentials so I don’t have to run to the grocery store at the last minute. Some of our stocked items include: spaghetti sauce, canned vegetables, canned fruit, boxed noodles, rice, and olives. **Crock pot meals: Crock pot meals are quick, easy and delicious! In addition, it also minimizes the time I have to spend cooking dinner. I can throw everything into the crock pot in the morning, turn it on low, and dinner will be ready as soon as we are. With Dawn’s line of power products, you can get the amazing power of an overnight soak in just five minutes. These products cut grease and dissolve tough foods on your everyday dishes (even the ones you bake in) without the effort of elbow grease! I wrote this blog post while participating in the SocialMoms and Dawn blogging program, to earn My SocialMoms Rewards Points, and I received free product for participating. The opinions and ideas expressed here are my own. Amen to the Alumninum foil! Saves so much work! Another tip I'd ad is put it where you use it, even if that's odd. I comb my kids hair at the kitchen table at breakfast, and got tired of going to their bathroom to retrieve their comb. Now it's in one of my kitchen drawers.